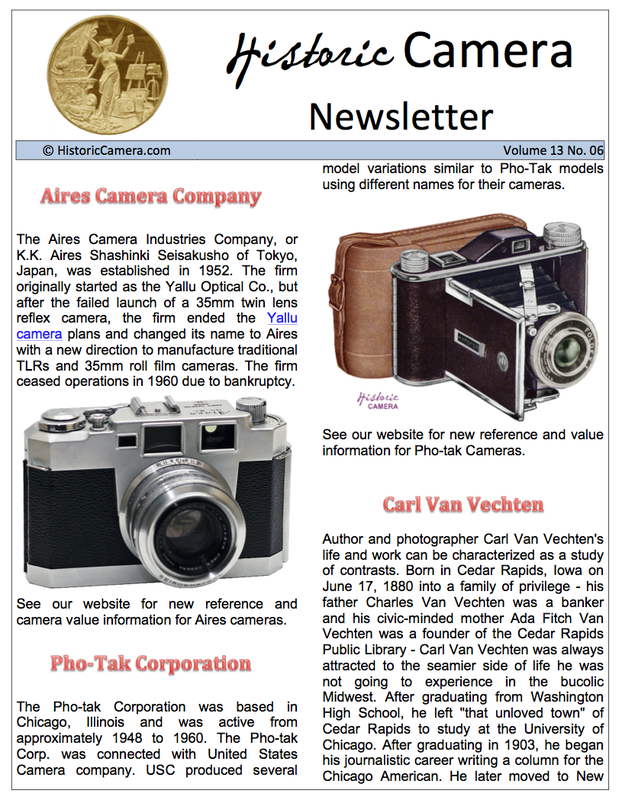 Featured - Announcement of new camera reference and value information for Aires and Pho-tak cameras on the HC website. Photographer biographies for Carl Van Vechten, Solomon D. Butcher and A.E. Arden. 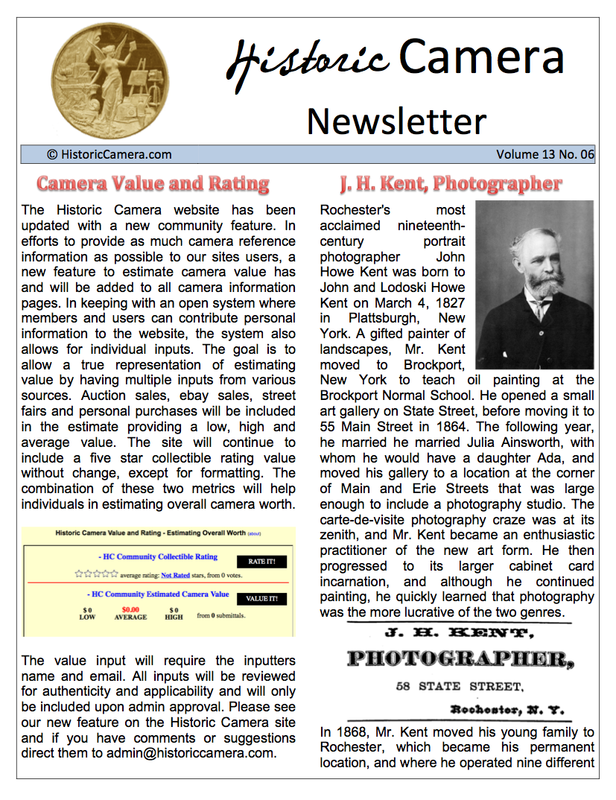 Featured - Historic Camera website update with a camera value and rating function. 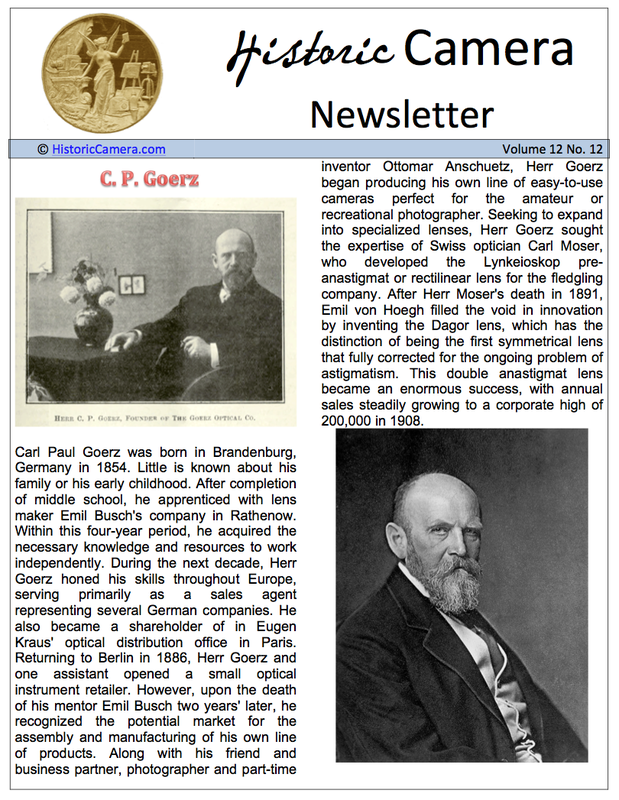 Brief history of the American Optical Company and Photographer Biographies for J.H. Kent of Rochester, H. Walter Barnett and Janez Puhar. 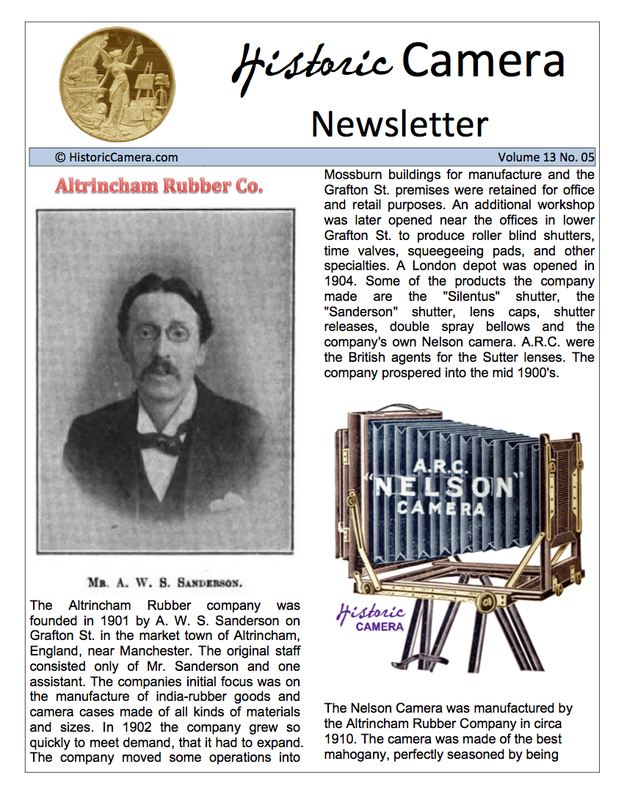 Featured - History of the Altrincham Rubber Company and the Association de Techniciens en Optique et Mecanique Scientifique or ATOMS company and biographies of photographers Darius Kinsey, H. Walter Barnett and T. R. Burnham. 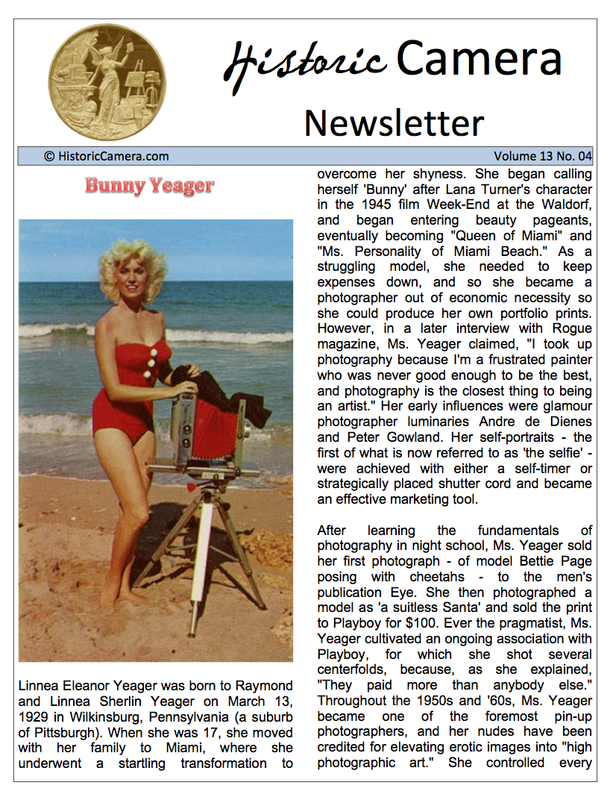 Featured - Photographer Biographies include the beautiful Bunny Yeager, the prince of photographers Henry H. Pierce, George W. Sittler and George R. Angell. It also includes a brief history of the American Camera Manufacturing Company. 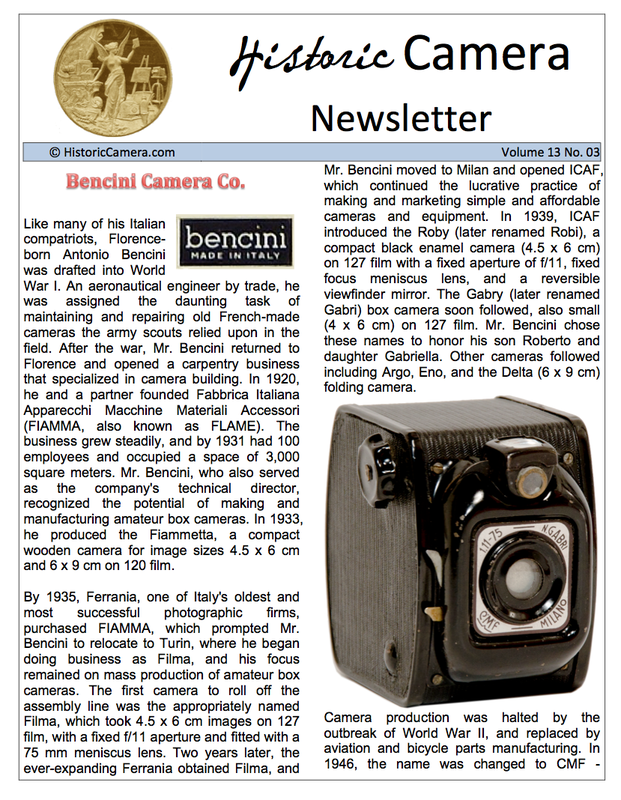 Featured - History of the Bencini Camera Company and of S. D. McKellen Camera maker. Biographies include photographers Bertha Shambaugh, Frank H. Wenham and Albert L. Rogers. 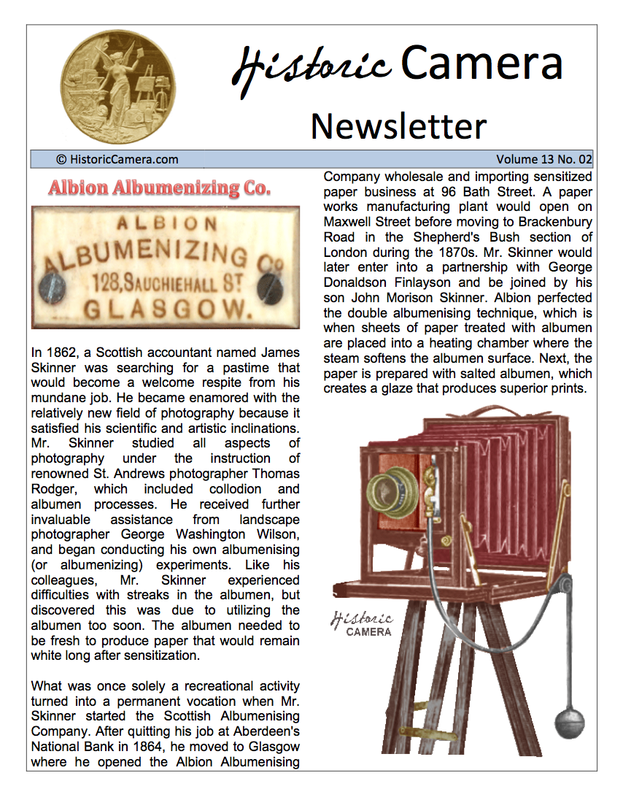 Featured - History of the firms of the Albion Albumenizing Co., E. G. Platt Manufacturer, R.T. Adams, Stereocrafters Inc., and the Wilby & Company. Biographies include photographers James. C. Farly, and the firm of Dozer & McCain. A year end summary of our 2015 statistics. 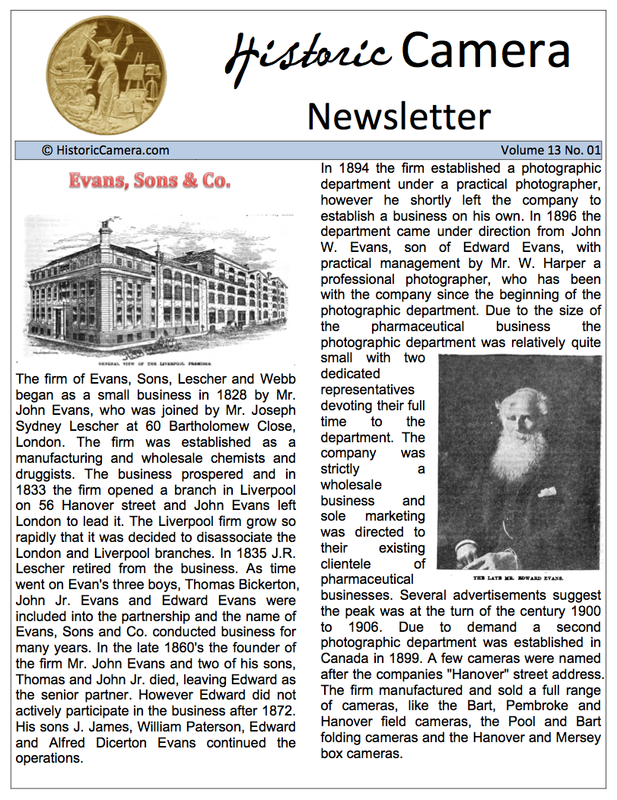 Featured - History of the firms of Evans, Sons & Co. originally of London and Liverpool, The Sanwa Co. limited of Japan and also of Emil Suter of Basel Switzerland. Additional Information is provided on the Unibox camera and the Aptus Camera. Biographies of Photographers J. D. Edwards, Novel Busey and Charles Reutlinger. Featured - Biographies of C.P. Goerz founder of Goerz Optical, Photographer Jessie Tarbox Beaks, Australian Photographer J.R. Hanna, and photographer J. Wells Champney. It also includes short articles of the Irwin Camera Co., L. G. Kleffel, Foto-Flex camera, The ERAC Selling Co. and the Encore Camera Co.. Featured - The history of J.T. 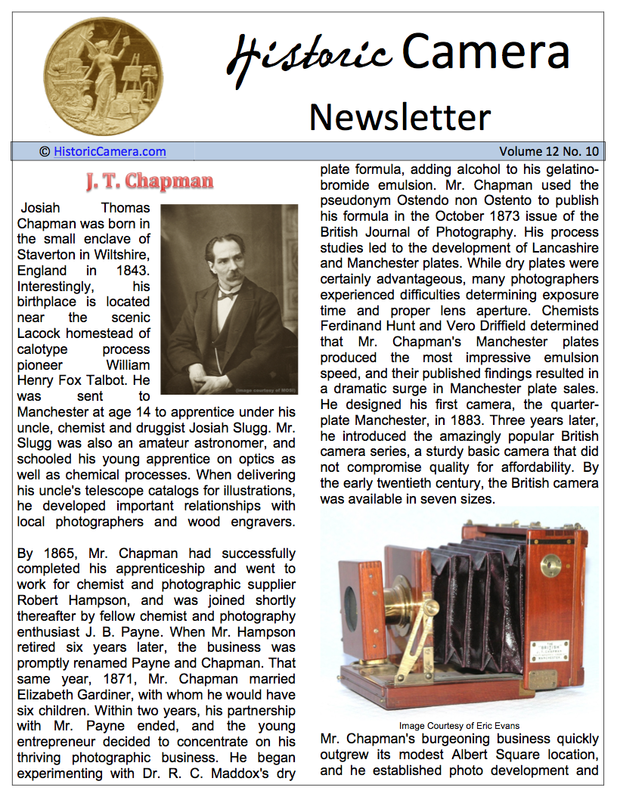 Chapman - Chemist and Photographic Supplier, a short history of the Detrola Corporation and biographies of photographers Dorethea Lang, Eadweard Muybridge and Bernard Alfieri. 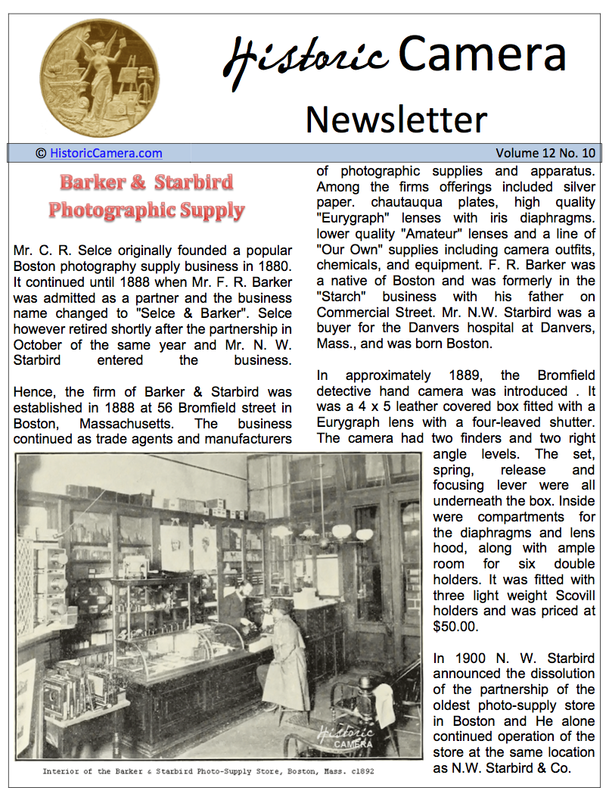 Featured - History of the Barker and Starbird photographic supply company, History of the photographic firm of J.J. Atkinson of Liverpool and history of D.H. Cussons chemist and camera maker of Southport. Also Biographies of Photographers E.W. Withington and Robert Henry Bow.